A Kanban board is one of the tools that can be used to implement Kanban to manage work at a personal or organizational level. Kanban boards visually depict work at various stages of a process using cards to represent work items and columns to represent each stage of the process. Cards are moved from left to right to show progress and to help coordinate teams performing the work. A Kanban board may be divided into horizontal "swimlanes" representing different kinds of work or different teams performing the work. Kanban boards can be used in knowledge work or for manufacturing processes. Simple boards have columns for "waiting", "in progress" and "completed" (or "to-do", "doing", and "done"). Complex Kanban boards can be created that subdivide "in progress" work into multiple columns to visualise the flow of work across a whole value stream map. Kanban board for software development team. 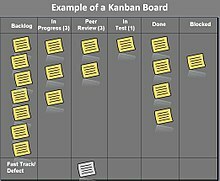 A popular example of a Kanban board for agile or lean software development consists of: Backlog, Ready, Coding, Testing, Approval, and Done columns. It is also a common practice to name columns in a different way, for example: Next, In Development, Done, Customer Acceptance, Live. Personal task management or "Personal Kanban" as described and promoted by Jim Benson. ^ "On Setting Your Initial WIP Limits". The Agile Director. 2014-12-07. Retrieved 2015-06-08. ^ Leybourn, E. (2013). Directing the Agile Organisation: A Lean Approach to Business Management. London: IT Governance Publishing: 160–166. ^ H. Kniberg, M. Skarin: Kanban and Scrum making the most of both. C4Media, Publisher of InfoQ.com, USA 2010, p. 31. ^ codeweavers. "Agile Design: Kanban with our Web Designers - Design, Process Updates | Codeweavers Blog | Staffordshire Software Development House". Codeweavers.net. Retrieved 2012-08-17. ^ "Kanban for Short Intense Projects: How We Used Kanban to Visualize Our Hiring Process Workflow and Make Our Lives Easier". Personal Kanban. 2011-01-19. Retrieved 2012-08-17. ^ "New Zealand Post Group – An Agile Executive!". Agile Business Management Consortium. 2013-12-02. Retrieved 2015-06-08. ^ Benson, Jim, and Tonianne DeMaria Barry. Personal Kanban: Mapping Work, Navigating Life. Modus Cooperandi Press, 2011. ^ Willeke, Marian HH. "Agile in Academics: Applying Agile to Instructional Design." Agile Conference (AGILE), 2011. IEEE, 2011. ^ "Agile and Internal Audit!". Agile Business Management Consortium. 2014-07-16. Retrieved 2015-06-08. ^ "Asana Kanban boards". Asana. 2017-05-01. ^ "Kanban Board". CA Technologies. 2017-11-13. ^ "Projektron BCS Kanban boards". Projektron GmbH. 2017-07-01. ^ "Tuleap Agile tools • Open Source Scrum planning, Kanban boards, project reporting". www.tuleap.org.